While Antony and Cleopatra have been immortalised in history and in popular culture, their offspring have been all but forgotten. Their daughter, Cleopatra Selene, became an important ruler in her own right. 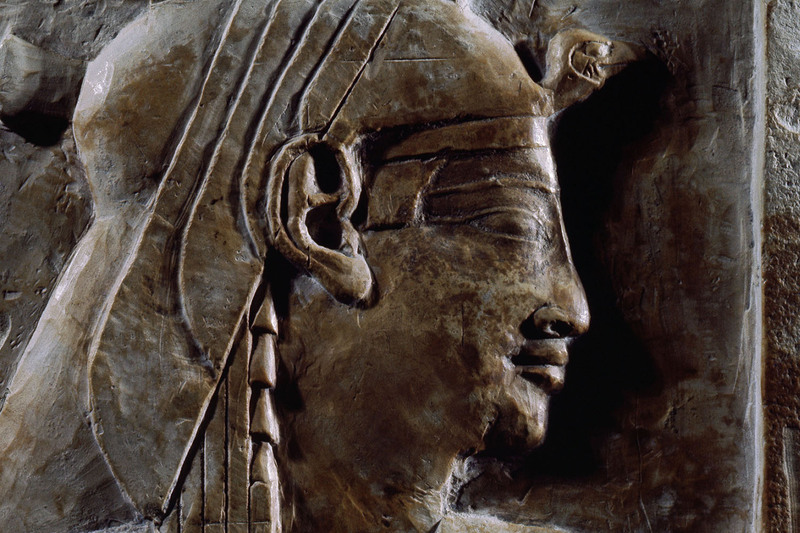 A fragment of a Ptolemaic relief believed to show Queen Cleopatra. Miscellanies is our free weekly long read. Sign up here and get it in your inbox. The love affair of Cleopatra VII, Queen of Egypt (69-30 BC), and Marcus Antonius, Roman triumvir (83-30 BC) is legendary. During their own lifetimes their liaison quickly became infamous, the subject of gossip, innuendo and outrage throughout the ancient world. It has remained a source of fascination for over 2,000 years, recorded first as fact in historical treatises and biographies written by Greek and Roman scholars and then as fiction in poems, plays, novels, television programmes and films. 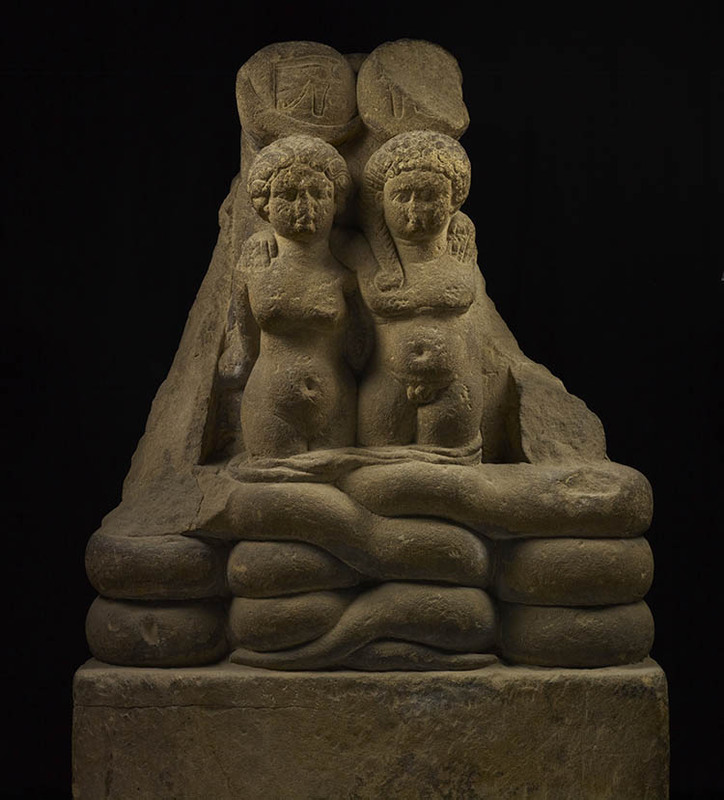 What is less well-known is that they had three children together: the fraternal twins Cleopatra Selene and Alexander Helios and their younger brother Ptolemy Philadelphos. The two sons Alexander Helios and Ptolemy Philadelphos disappeared from the historical record without explanation early on, probably falling victim to illness during childhood. Cleopatra Selene, however, not only survived into adulthood but became an important and influential political figure in her own right. She claimed descent from the mythological figure of the Greco-Roman demi-god Herakles / Hercules and the historical heroes Philip of Macedon, Alexander the Great, Ptolemy I Soter and Ptolemy II Philadelphos, as well as kinship with the Julio-Claudian emperors Augustus, Tiberius, Caligula, Claudius and Nero. Over the course of her eventful life she was first an Egyptian princess, then a Roman prisoner and finally an African queen. Ironically, unlike her mother and the contemporary female rulers Cartimandua of the Brigantes, Boudicca of the Iceni and Zenobia of Palmyra, who have been remembered for the domestic strife, civil wars and rebellions of their regimes, the reason little is known of Cleopatra Selene is because she was successful. By 42 BC the last of Gaius Julius Caesar’s assassins, Marcus Junius Brutus and Gaius Cassius Longinus, had been defeated and killed at the Battle of Philippi in northern Greece. In the aftermath of the battle the victors, Antony and Julius Caesar’s great nephew and heir Gaius Octavius, had divided the Roman world between them; Antony received the East, Octavian the West. During the years that followed, Antony’s priority was the invasion and subjugation of Rome’s old enemy Parthia; Caesar had been in the process of planning such an action when he was assassinated in 44 BC in revenge for the defeat of the Roman general Marcus Licinius Crassus at the Battle of Carrhae in 53 BC. In order to launch a successful military campaign, Antony not only required a base of operations in the East but also funds, supplies and equipment. In the autumn of 41 BC Antony summoned Cleopatra to meet him at Tarsus in Asia Minor. She was the ruler of Rome’s wealthiest client kingdom, a region where the annual inundation of the Nile covered the land either side of the river in a layer of thick black silt so agriculturally fertile that it was possible to harvest multiple crops each year and where the Eastern Desert had been found to contain fabulous mineral resources that were mined for gold, precious stones and coloured marbles. In addition to the natural advantages provided by the climate, environment and geology of Egypt, the city of Alexandria was a major centre of trade in the Mediterranean and the kingdom also had the monopoly of trading with India and the Far East. Although Greek and Roman writers enjoyed claiming that Antony succumbed to Cleopatra’s charms and fell in love with her at first sight, the encounter in Tarsus was not actually the first time the two had met. They had come across each other on several previous occasions, first at the royal court in Egypt, while Antony was serving in the region in 55 BC and Cleopatra was still a teenager, and then again some years later at Caesar’s house in Rome while Cleopatra stayed there with their son Caesarion between 46 and 44 BC. However, it is clear that on this occasion Cleopatra deliberately set out to make a favourable impression on Antony. After all, with Caesar dead, she and her son needed a new powerful Roman protector. [Cleopatra] received several letters, both from Antony and from his friends, to summon her, but she took no account of these orders; and at last, as if in mockery of them, she came sailing up the river Cydnus, in a barge with gilded stern and outspread sails of purple, while oars of silver beat time to the music of flutes and fifes and harps. She herself lay all along, under a canopy of cloth of gold, dressed as Venus in a picture, and beautiful young boys, like painted Cupids, stood on each side to fan her. Her maids were dressed like Sea Nymphs and Graces, some steering at the rudder, some working at the ropes. The perfumes diffused themselves from the vessel to the shore, which was covered with multitudes, part following the galley up the river on either bank, part running out of the city to see the sight. The market-place was quite emptied, and Antony at last was left alone (Life of Antony 25.5-26.3). There is no doubt that Cleopatra carefully orchestrated every last detail of her arrival in Tarsus. She entered the city with her kingdom’s wealth prominently displayed and this tactic could not have been more attractive to Antony, who was not only in need of money to fund his military campaign against Parthia, but had been chronically debt ridden for the majority of his adult life. In addition to money, she offered him something else that he had been missing and that was the opportunity for fun and decadent self-indulgence. She provided so much of it in Tarsus that he abandoned his wife, Fulvia, and returned with Cleopatra to Alexandria, staying there for the remainder of the year before departing the following spring. Cleopatra Selene and Alexander Helios were born later that year, some time during the autumn of 40 BC. While no record of their precise date of birth or even their order of birth has survived, what is certain is that, while the truth of their elder brother Caesarion’s paternity was repeatedly questioned in antiquity, the fact that Antony was the father of the twins was never doubted. On the contrary, over the next decade Octavian’s negative propaganda made much of the fact that Antony had not only indulged in a shameful liaison with a foreign woman that had resulted in him rejecting not just one but two lawful Roman wives (Fulvia died in 40 BC and was promptly replaced by Octavian’s sister Octavia), but he had also fathered a brood of illegitimate foreign children. Antony’s response to these accusations was not to deny them, but rather to claim that on the contrary his actions were not only entirely justified, but also in the interest of the Roman people and their empire. Yet, although he probably knew about the pregnancy and the twins’ subsequent birth, he made no attempt to return to Egypt. It was not until 37 BC, when Antony summoned Cleopatra to meet him once more, this time at Antioch in Syria, and she brought the twins with her, that he met them for the first time and formally acknowledged paternity. In the eyes of Cleopatra’s Egyptian subjects her relationship with Antony was the equivalent of a dynastic marriage, as her prior relationship with Caesar had been, and therefore Cleopatra Selene and Alexander Helios were legitimate, just as Caesarion was. Like him they had a part to play in the succession and with this in mind Cleopatra selected their names very carefully. Both Alexander and Cleopatra had Macedonian, Seleucid and Ptolemaic precedents that linked the twins with past prominent members of other Near Eastern royal families, although the most obvious contemporary associations would have been with Alexander the Great and Cleopatra VII herself. The second names Helios (Sun) and Selene (Moon) not only marked the twins, rather whimsically, as a pair, but also served to associate them (Alexander Helios in particular) with beliefs and prophecies that were circulating around the Roman Empire regarding a forthcoming ‘golden age’. Clearly, great things were expected of both of them. Over the next couple of years, Antony bestowed vast swathes of land onto Cleopatra and her children. These grants ensured that Egypt gradually regained the territories the kingdom had ruled at its peak during the reign of Ptolemy II Philadelphos. Whatever Antony’s reasoning behind the grants, which formed a small part of the reorganisation of the eastern provinces under his command, it was at this point that Cleopatra began to use a new system of dating to calculate her reign, which made her feelings about them clear. She had succeeded in reconstituting the Ptolemaic Empire as it had been during the reigns of Ptolemy I Soter (r. 323-283 BC) and Ptolemy II Philadelphos (r. 283-246 BC). Certainly, it was around this time that she bore her fourth and last child, who was named after Ptolemy I Soter’s son and heir, Ptolemy II Philadelphos, the ruler who had won all these territories in the first place. Antony’s Parthian campaign proved to be a humiliating failure, although that did not prevent him from returning to Alexandria as a conquering hero in 34 BC. Shortly afterwards, a lavish ceremony that has come to be known as the Donations of Alexandria was held in the city’s gymnasium. Huge crowds assembled to witness Antony and Cleopatra (dressed as the Egyptian goddess Isis) sitting on golden thrones on a silver platform with Caesarion, Cleopatra Selene, Alexander Helios and Ptolemy Philadelphos sitting on smaller and less ornate ones just below them. Antony declared Cleopatra to be Queen of Kings, Caesarion to be the true son of Caesar and King of Egypt and proceeded to bestow kingdoms of their own upon Cleopatra Selene, Alexander Helios and Ptolemy Philadelphos. Cleopatra Selene was given Crete and the Cyrenaica, both territories that were particularly associated with the families of Antony and Cleopatra. Her paternal grandfather, Marcus Antonius Creticus, had been ordered to rid Crete of pirates and the Ptolemies had once controlled the Cyrenaica. Alexander Helios, dressed in traditional Parthian costume, was given the kingdoms of Armenia and Media (he was also betrothed to the latter kingdom’s princess Iotape) and all the territory east of the Euphrates as far as India, essentially the Parthian Empire that Antony had yet to conquer. Ptolemy Philadelphos, dressed in traditional Macedonian costume, was given the Syrian territories, which Cleopatra had recently reclaimed in order to reconstitute the Ptolemaic Empire, and was made overlord of the Near Eastern client kingdoms west of the Euphrates. Still very young children, neither of the twins nor Ptolemy Philadelphos was in any position to assume control of their lands at that point, but it was clear that both Antony and Cleopatra intended they should do so within a matter of years. Already outraged by the Donations of Alexandria, the discovery of an alleged copy of Antony’s will, which contained the revelation that he wished to be buried in Alexandria with Cleopatra rather than in Rome with Octavia, was the final straw for Octavian. After a decade of hostility, diplomatic relations between the two finally faltered, making military action inevitable. 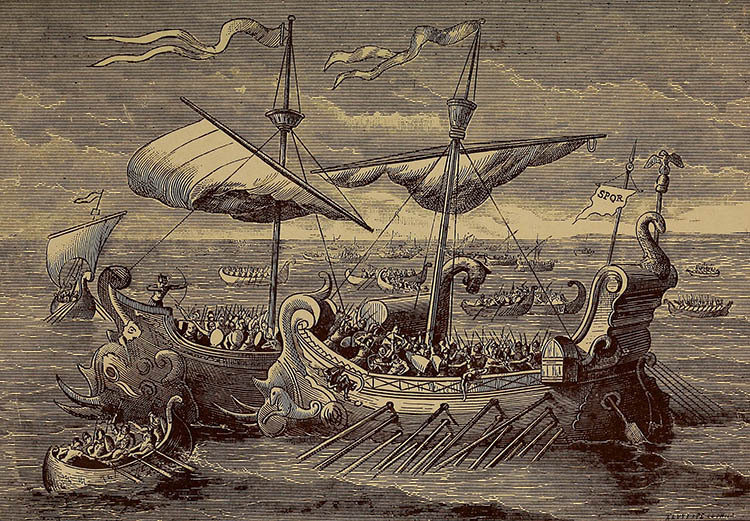 The two factions came face to face with each other off the coast of Greece at the Battle of Actium in September 31 BC. Octavian won the battle although his victory was far from decisive and was only achieved with the help of his friend and colleague Marcus Vipsanius Agrippa. In the wake of their defeat Antony and Cleopatra returned to Alexandria. While Antony suffered a nervous breakdown and went into seclusion, Cleopatra began planning her next move. Over the next few months she sent a series of messengers to Octavian, offering first to betray Antony and then, when that proved unsuccessful, to abdicate in favour of her children. By the time Octavian arrived in Egypt in the summer of 30 BC Antony and Cleopatra were ready to make one last stand but, preparing for the worst, had sent the children away. Once defeat was inevitable, they famously each committed suicide rather than surrender. Caesarion headed to India but en route he was betrayed by his tutor, intercepted by Roman forces and executed. Cleopatra Selene, Alexander Helios and Ptolemy Philadelphos went south to Thebes. However the deaths of their mother and Caesarion left Cleopatra Selene and Alexander Helios nominally in charge of Egypt, so they were brought back to Alexandria to reign in name only until the kingdom was officially annexed by the Roman Empire two weeks later. When Octavian left the newly created province, he took the twins and Ptolemy Philadelphos back to Rome with him. Octavian had originally hoped to take Cleopatra alive. This would have allowed him to parade her through the streets of Rome during the triple triumph he was planning to celebrate his victories against Illyricum, Actium and Egypt, just as Caesar had paraded her sister Arsinoë in his own triumph celebrating his victory in the Alexandrian War in 48 BC. Obviously Cleopatra’s suicide made this impossible, so instead he paraded an effigy of her holding an asp, while Cleopatra Selene and Alexander Helios, dressed as the moon and the sun in reference to their names, walked beside it. Their participation in the Egyptian section of Octavian’s triple triumph served to draw their Egyptian lives to a close. For the first ten years of her life Cleopatra Selene had been raised in Egypt as an Egyptian princess at an Egyptian court; the fact that her father was a Roman citizen, former consul and triumvir was virtually irrelevant at this stage of her life. However, once both of her parents were dead and Egypt had ceased to exist as an independent kingdom, the question of what to do with Cleopatra Selene and her brothers needed to be answered. In the absence of any surviving relatives, responsibility for them passed to Octavian and he in turn passed it to Octavia. The children lived in Octavia’s house on the Palatine Hill in Rome as members of an extended family that included their half-brother Iullus Antonius (Antony’s son with Fulvia) and half-sisters, both called Antonia (Antony’s daughters with Octavia), as well as Octavia’s older children from a previous marriage, Marcus Claudius Marcellus and his two sisters, both called Marcella. Living not far away were Octavian, who was now known as Augustus, and his wife Livia Drusilla, Augustus’ daughter Julia and Livia’s sons Tiberius Claudius Nero and Decimus Claudius Drusus. In addition to the members of these two households, Augustus had gradually accumulated a collection of royal children. Mostly these were the heirs of friendly client rulers, who had been sent to Rome as a means of ‘Romanising’ them to make them more effective client kings, but it also included several individuals who were the offspring of former client rulers, who had been deposed or had died, or both. One of the latter was Gaius Julius Juba, the son of King Juba of Numidia (modern-day Algeria, Tunisia and Libya), who had committed suicide in 46 BC after being defeated by Caesar at the Battle of Thapsus. Only a baby at the time, Juba had been taken back to Rome by Caesar and exhibited in the African section of his quadruple triumph. He had subsequently been raised in Caesar’s household until the dictator’s assassination in 44 BC when custody of the child seems to have passed to Octavian and Octavia. 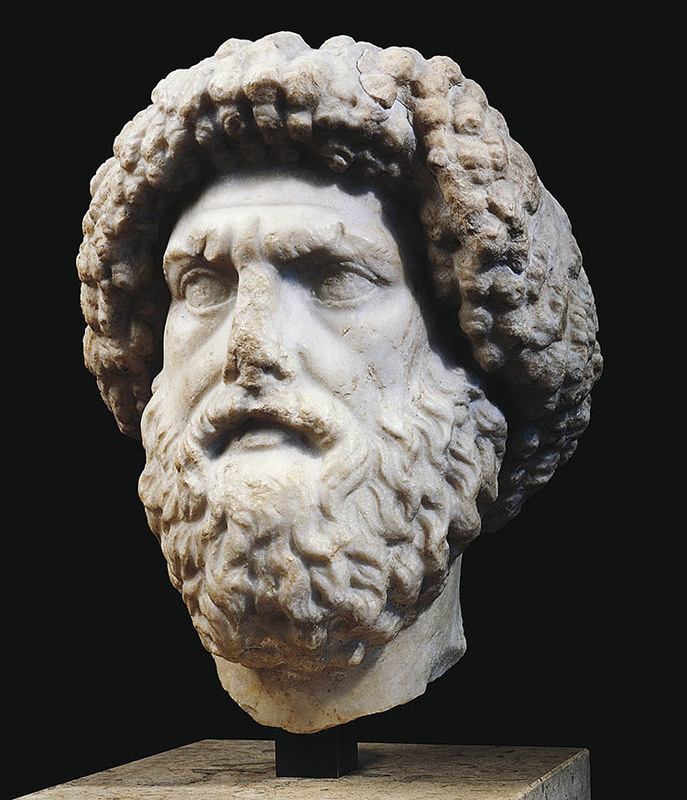 Juba was awarded Roman citizenship and spent his childhood and adolescence in Rome during which time he was given a Roman education and encouraged in intellectual pursuits, which led to him writing scholarly treatises on a range of subjects (many of which were used by Pliny the Elder as sources for his enormous 37-volume Natural History). With his contemporaries Marcellus, Tiberius and Drusus he even undertook military service with the Roman legions in Spain before Augustus decided to confer on him the newly created client kingdom of Mauretania as his Numidia had now been turned into the Roman province of Africa Nova. Great neighbouring regions of the world, which the Nile, swollen from black Ethiopia, divides, you have created common kings for both through marriage, making one race of Egyptians and Libyans. Let the children of kings in turn hold from their fathers a strong rule over both lands. Cleopatra Selene and Juba had much in common. Both had been orphaned at a young age by their respective parents’ suicides, both had had their ancestral lands confiscated and both had been displayed in triumphal processions before being encouraged to start a new Roman life. They were also politically problematic and marrying them and installing them as client rulers was a potentially excellent solution. So, following the wedding, Augustus proclaimed them king and queen of Mauretania and sent them there to rule as his clients. The young couple had had their lives turned upside down as a result of the actions of their parents. Once they arrived in Mauretania they were free to make their own decisions, accountable to no one, except possibly Augustus. They had much to do: the new kingdom of Mauretania was a vast territory, encompassing modern-day Algeria and Morocco, rather than modern-day Mauritania. As might be expected with one large kingdom created from two smaller ones, there were two capital cities, Iol (now Cherchell) on the Mediterranean coast and Volubilis (now Walili) further inland. Mauretania also contained a smattering of Greek and Roman colonies, originally founded to facilitate trade with Hispania Baetica (Andalusia). Cleopatra Selene and Juba proved more than equal to the task. Although Juba was now indisputably the King of Mauretania, he had never been King of Numidia, or anywhere else. Cleopatra Selene, on the other hand, had not only been declared Queen of Crete and the Cyrenaica in 34 BC, she had also reigned as the Queen of Egypt in 30 BC, if only for a short while. 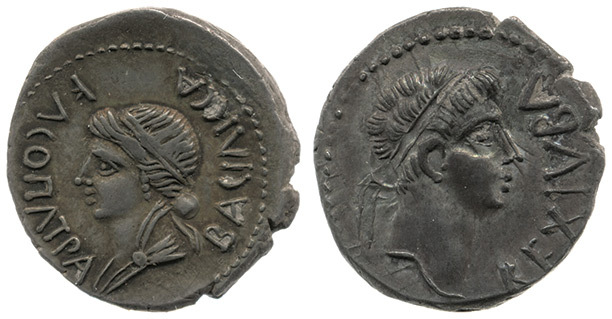 Consequently she possessed enough prestige to rule alongside her husband as a queen in her own right and consistently referred to her Greek and Egyptian heritage on the coins she issued in her own name as well as those she issued in conjunction with Juba. Their new kingdom was in serious need of modernisation, so they refounded Iol as Caesarea in honour of their benefactor Augustus. (It could also have been an attempt to compete with Herod, the client king of Judea, who had done likewise several years earlier.) They filled Caesarea with grandiose buildings inspired by those of Rome and also of Alexandria. These included a lighthouse in the style of the Alexandrian Pharos, set up on an island in the harbour, a royal palace situated on the seafront and numerous temples to Roman and Egyptian deities. Their royal court attracted scholars and artists from across the Roman Empire and became a cosmopolitan fusion of Greek, Roman and Egyptian culture. The moon herself grew dark, rising at sunset, covering her suffering in the night, because she saw her beautiful namesake, Selene, breathless, descending to Hades, with her she had had the beauty of her light in common, and mingled her own darkness with her death. She was survived by her husband and their son Ptolemy, who ruled in conjunction with his father for some years before succeeding to sole rule upon Juba’s death in AD 23. He reigned until AD 40, when he was executed on the orders of the emperor Caligula, his mother’s great nephew. Ptolemy died without issue and, when Caligula was assassinated the following year, his successor Claudius decided to take advantage of the situation and assume control of the kingdom. After only 65 years the territories so recently unified were once again divided and then converted into the Roman provinces of Mauretania Caesariensis and Mauretania Tingitana. Cleopatra Selene, Juba and Ptolemy were forgotten. Jane Draycott is Lord Kelvin Adam Smith Research Fellow in Ancient Science and Technology at the University of Glasgow. 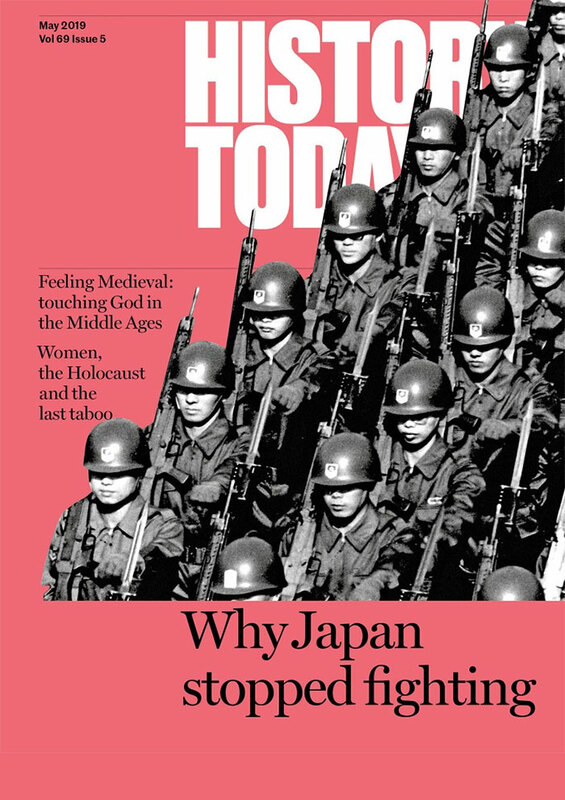 This article originally appeared in the April 2013 issue of History Today.